On a happier note, Munchkin decided to have his training wheels taken off. 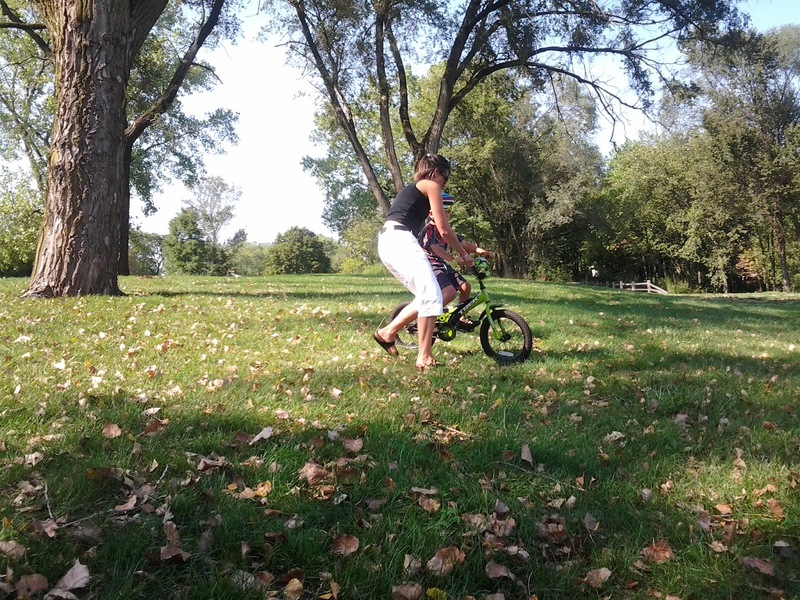 So yesterday when we came home from my parents', Kovas took the training wheels off his bike and we all headed to a local park with a gently sloping hill. Kovas and I took turns holding Munchkin as he rode down and back up. Finally getting the sense of balance, Kovas was able to let go momentarily and Munchkin continued to ride on his own for a short while. After several successful attempts, Munchkin decided to call it quits for the day. Couple more sessions, and he'll be zooming around on his own!! Poor kid... good thing he's so resilient! Poor guy! I hate when my kids get hurt--would trade places with them in a minute! And yay to ditching training wheels! It's good you're a nice mom-nurse-empathetic/sympathetic person, because he didn't get too much of it from me. :) Glad he's okay. So happy that Tazer is okay! That must have been scary! LOL @ the bickering being a sign that Tazer was back! Hee hee. Oh, wow...scary! J fell a couple years ago while miniature golfing (yeah, we go for the extreme sports. :D) and blacked out for a moment. Lucky you had a dr in the family! Poor guy. That would be scary to be unable to remember a wreck that caused so much pain. And my kids are fully obsessed with minecraft. Even the three year olds. That's so scary. I have 6 - much older now. But my daughter when she was 8 or 9 was twirling round and round on the asaphalt and fell, bonked her head, was knocked out and couldn't remember anything. Very scary, she was fine. Thankful your little one is fine!! Hard to be a parent at times.